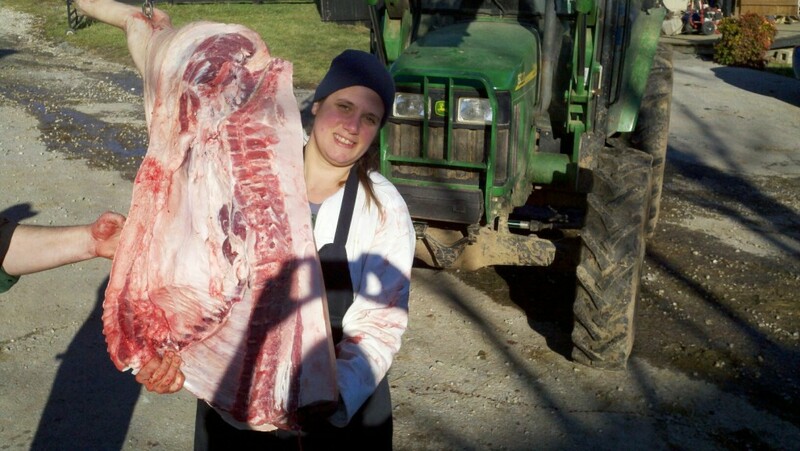 The first pig Nicole processed with Brett Corrieri. The slow creep from city living (where Portlandia's depiction of a life of dependency on services in weirdly disjointed communities feels very real) to independent living on a small homestead (where your friends think you might be friends with Grizzly Adams) is rather like growing older. One day you look in the mirror and darned if the face you see in the mirror is different than the 17-year-old one you see in your mind's eye. We moved way out here to our 3-acre, beat up paradise in 2007. Our first batch of chickens came with the following agreement from me: I will raise them and care for them, but on processing day, I plan to be out shopping. What I thought then: There was no way I could possible raise cute little animals and then process them. What really happened: Four days in, I culled my first baby chick because it was suffering. On butcher day, I was on site actively helping. This was the beginning of a long series of "What I thought then" versus "What really happened." Homesteading is a rewarding way to learn all the things you CAN do while failing forward as you learn how to do them. While listening to The Survival Podcast, show host Jack Spirko asked listeners to share things about which they have changed perspective since making the journey into homesteading. One of his listeners had commented that in looking for housing, he had found one with a human waste system that cleanses the water, then uses it to water the lawn. He thought of this system as an asset but then realized that many in our culture would consider it a negative point. He realized not only that, but HE would have thought the same thing several years ago. It reminded me of one of those "looking in the mirror" moments on our journey where the face in the mirror was not the one of my memory. After years of raising and processing chickens, Chef Brett invited me to share a pig with him. The only catch was that we would need to process it. I tagged along as the processing assistant and the moment came: He had eviscerated the pig, had his hands full of liver and needed to hand it off. I have to admit, I paused for a split second wondering if I should grab a container. Then I thought, "Screw it, there is no way I am going to make it through the day with clean hands," and grabbed the liver and took it to the bagging table. That was a moment when I realized that I no longer thought of processing animals as gross - just part of the food cycle. How different that moment from the days where I would barely touch the meat I was preparing under the fear of contamination. THE REDNECK YACHT CLUB sets sail this weekend at Hurricane Marina on Center Hill Lake! We play at 7pm. Here are the directions! From I-40, take Exit 273 toward Smithville / McMinnville. Follow TN-56 South for 3.5 miles. Turn RIGHT onto Floating Mill Road, and follow the signs towards Hurricane Marina. A friend of mine, Steve Williams, wrote a country song entitled "Redneck Yacht Club" with a buddy of his named Tom Shepard and it was a big hit single a couple of years ago by Craig Morgan. Now Steve and Tom have starting doing gigs calling their act "The Redneck Yacht Club". Most of the gigs are at marinas as they're playing up the "boating" thing. That's what this is all about. We're doing songs they've written along with some Jimmy Buffet tunes and other fun stuff. Tell everybody to come out! I was talking to a friend today and realized that realists and idealists need each other. In my little world the realist needs the idealist to spout of what seems an impossible dream to make their more realistic solutions seem possible. On the other hand, the idealist needs the realist to find compromises to the ideal in the interest of avoiding complete catastrophic failure. I did not watch the whole event, but noticed on my way through the room that the way the oscar logo was cropped on the TV when they listed people's names looks like a giant fist with just the middle finger up. At first, I thought I needed glasses, but then my roommates agreed. Maybe we all need glasses?